Stuart Allen "Stu" Roosa (August 16, 1933 – December 12, 1994), Col., USAF, was an American aeronautical engineer, United States Air Force pilot, test pilot, and NASA astronaut, who was the Command Module Pilot for the Apollo 14 mission. The mission lasted from January 31 to February 9, 1971 and was the third mission to land astronauts (Alan Shepard and Edgar Mitchell) on the Moon. While Shepard and Mitchell spent two days on the lunar surface, Roosa conducted experiments from orbit in the Command Module Kitty Hawk. He was one of 24 men to travel to the Moon. Roosa was born on August 16, 1933, in Durango, Colorado, to parents Dewey Roosa (1903–1988) and Lorine Roosa (née DeLozier; 1908–1993) and grew up in Claremore, Oklahoma. He attended Justus Grade School and Claremore High School in Claremore, Oklahoma, from which he graduated in 1951. Thereafter, he studied at Oklahoma State University and the University of Arizona, before receiving a Bachelor of Science degree in aeronautical engineering with honors from the University of Colorado Boulder in 1960. Roosa began his career as a smokejumper with the U.S. Forest Service, dropping into at least four active fires in Oregon and California during the 1953 fire season. He was a graduate of the Aviation Cadet Program at Williams Air Force Base, Arizona, where he received his flight training commission in the U.S. Air Force. He also attended the Aerospace Research Pilot School and was an experimental test pilot at Edwards Air Force Base in California before being selected for the astronaut class of 1966. From July 1962 to August 1964, Roosa was a maintenance flight test pilot at Olmstead Air Force Base, flying F-101 aircraft. He was a fighter pilot at Langley Air Force Base, where he flew the F-84F and F-100 aircraft. Following graduation from the University of Colorado, under the U.S. Air Force Institute of Technology Program, he served as Chief of Service Engineering (AFLC) at Tachikawa Air Base, for two years. Roosa was one of 19 people selected as part of the astronaut class of 1966. He was the CAPCOM at the Launch Complex 34 blockhouse during the Apollo 1 fire on 27 January 1967. In 1969, he served as a member of the astronaut support crew for the Apollo 9 mission. On Apollo 14 he spent 33 hours in solo orbit around the Moon, conducting an extensive series of experiments. On the Apollo 14 mission Roosa carried seeds from loblolly pine, sycamore, sweet gum, redwood, and Douglas fir trees as part of a joint U.S. Forest Service/NASA project. The seeds were germinated on his return and planted throughout the United States, becoming known as the "Moon Trees". Following Apollo 14, Roosa served as backup Command Module Pilot for Apollo 16 and Apollo 17, and based on crew rotations, would probably have commanded one of the last Apollo missions had they not been cancelled. He was assigned to the Space Shuttle program until his retirement as a Colonel from the Air Force in 1976. Roosa logged 5,500 hours of flying time; 5,000 hours in jet aircraft. He also logged 217 hours in space. Roosa attended Harvard Business School's six-week Advanced Management Program in 1973. He retired from the military as a Colonel in 1976. After leaving NASA and the Air Force, Roosa held a number of positions in international and U.S. businesses, and became owner and president of Gulf Coast Coors in 1981. On December 12, 1994, Roosa died at age 61 in Washington, D.C. from complications of pancreatitis. He was survived by his wife Joan, three sons and a daughter, and seven grandchildren. Roosa is buried in Arlington National Cemetery. His wife Joan died on October 30, 2007, in Gulfport, Mississippi. She was interred at Arlington with her husband. Roosa's memberships include the Society of Experimental Test Pilots, New York Safari Club, Board of Directors, People-to-People Sports Committee, Hunting Hall of Fame, Circumnavigators Club, Explorers Club, Confederate Air Force, Shikar-Safari-Club and Gulfport Yacht Club. Roosa's honors include the NASA Distinguished Service Medal; the MSC Superior Achievement Award (1970); the Air Force Command Pilot Astronaut Wings; the Air Force Distinguished Service Medal; the Arnold Air Society's John F. Kennedy Award (1971); the City of New York Gold Medal (1971); the American Astronautical Society's Flight Achievement Award (1971); the Order of Tehad (1973); and the Order of the Central African Empire (1973). Additionally, an elementary school in Claremore, Oklahoma is named in his honor. He received an honorary LL.D. from University of St. Thomas, Houston in 1971. He was one of five Oklahoman astronauts inducted into the Oklahoma Aviation and Space Hall of Fame in 1980 and he was inducted into the International Space Hall of Fame in 1983. Roosa was posthumously inducted into the U.S. Astronaut Hall of Fame in 1997. In the HBO miniseries From the Earth to the Moon (1998), Roosa was played by George Newbern. The book Smoke Jumper, Moon Pilot (2011), by Willie G. Moseley, is a biography on Roosa's life. 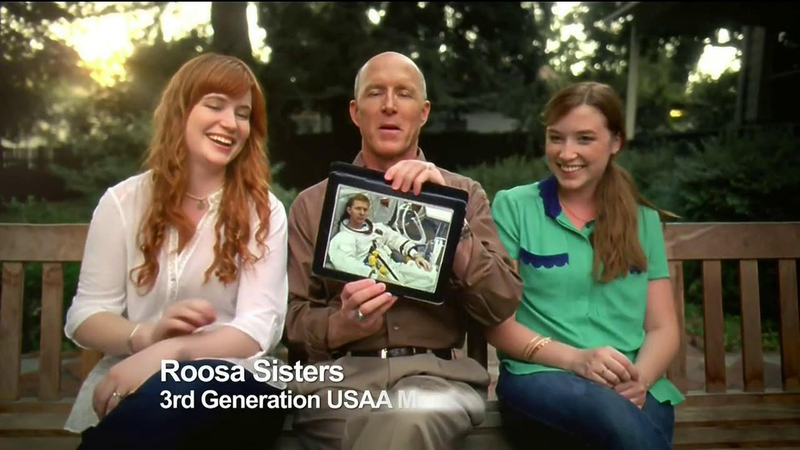 In 2013, footage of Roosa's son holding a photo of Roosa with two of his granddaughters appears in USAA insurance television ads promoting availability to family members. In 2014, a USAA radio ad featuring Roosa's son ran on many U.S. radio stations. ^ a b c d e f g h i "NASA Roosa Biography". NASA JSC. Retrieved June 2, 2017. ^ "Piloted the command module on Apollo 14 mission". New Mexico Museum of Space History. Retrieved November 12, 2017. ^ "Roosa's flight experience". Nssdc.gsfc.nasa.gov. Retrieved 11 August 2017. ^ Shayler, David (2002-01-01). Apollo: The Lost and Forgotten Missions. Springer Science & Business Media. p. 131. ISBN 9781852335755. ^ "Houston, We Have Moon Trees". Peeling Back the Bark. Forest History Society. February 17, 2011. ^ "Start A. Rosa". International Space Hall of Fame. New Mexico Museum of Space History. 2005. ^ Colin Burgess, ed. (2010). Footprints in the dust : the epic voyages of Apollo, 1969–1975. University of Nebraska Press. p. 195. ISBN 9780803226654. ^ "State Aviation Hall of Fame Inducts 9". The Daily Oklahoman. Oklahoma City, Oklahoma. December 19, 1980. p. 2S – via Newspapers.com. ^ "Stuart A. Roosa - Astronaut Scholarship Foundation". astronautscholarship.org. Retrieved 11 August 2017. ^ Moseley, Willie G. (2011-10-31). Smoke Jumper, Moon Pilot. Acclaim Press. ISBN 978-1935001768. ^ "Mine Was Earned — USAA Auto Insurance". YouTube. USAA. October 2, 2013. Steitz, David E.; Herring, Kyle (December 12, 1994). 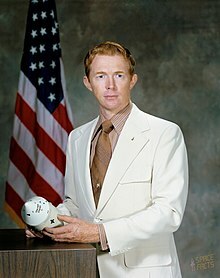 Apollo Astronaut Stuart Allen Roosa Dies. Press release 94-210. NASA. Retrieved 23 December 2013. Wikimedia Commons has media related to Stuart Roosa. "Houston, We Have Moon Trees". Peeling Back the Bark blog, the Forest History Society.